In Manhattan for their first time, the Guardians of the Ribbon, a group of firefighters and their families and friends, brought Nicki to help raise awareness of breast cancer and K-State cancer research. The Guardians’ mission is to spread love and hope and help philanthropies raise money for their local cancer-related causes. Visitors are invited to sign Nicki, as a traveling memorial…and she is covered in loving tributes. 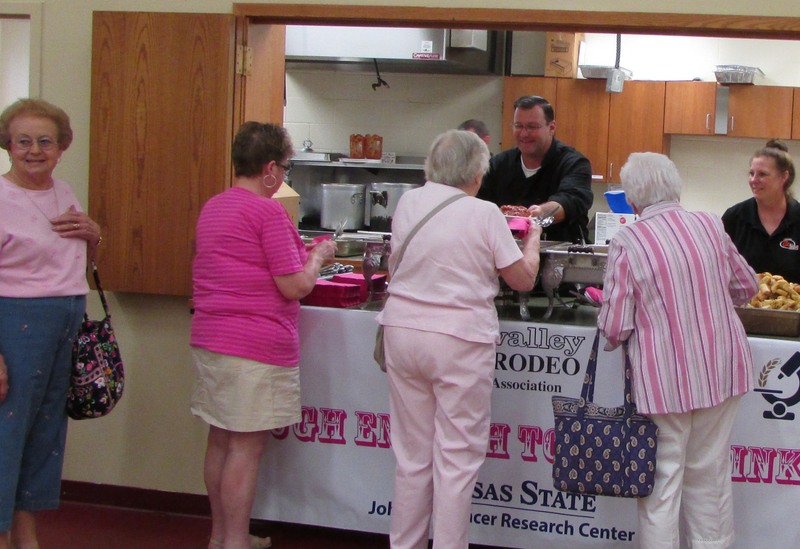 In addition to proceeds from rodeo ticket and pink item sales, we also received funds raised at a Spaghetti Dinner on Sun., July 14. Chef Drew Zink and volunteers made the delicious, all-you-can-eat dinner, which was enjoyed by hundreds of people. 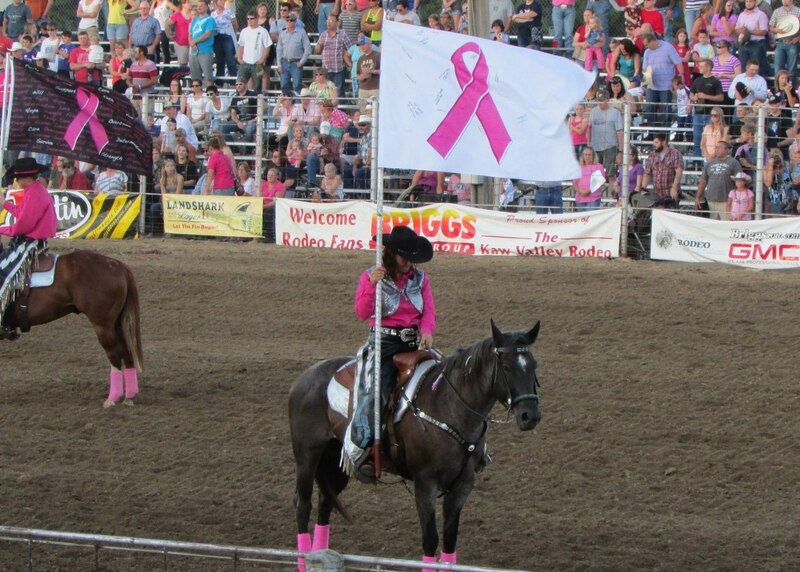 We are so grateful to the Kaw Valley Rodeo Association and the “Pink Committee” for choosing to support local cancer research! 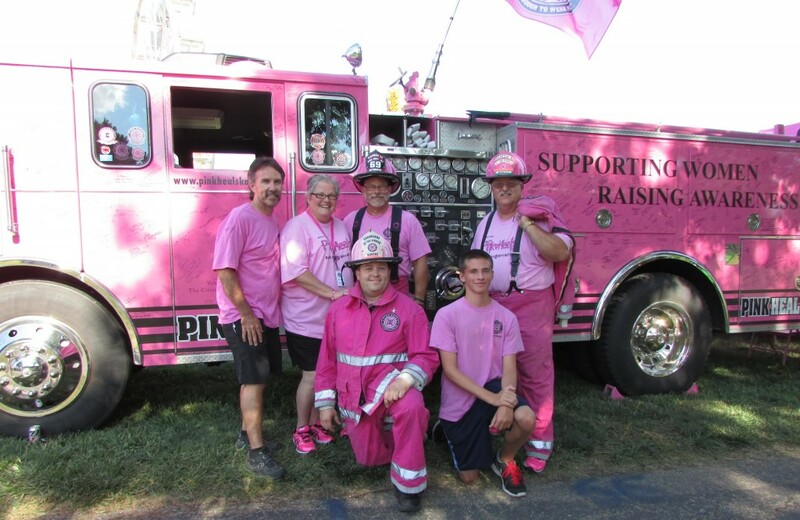 This year’s Tough Enough to Wear Pink campaign raised almost $11,000! That brings their total to $58,000! We also thank the the biggest rodeo crowd in seven years, and Mother Nature for the beautiful weather that helped bring them out! We thank our volunteers that helped sell balloons, including members of Sigma Alpha professional agriculture sorority and the Manhattan Breast Cancer Support Group, as well as other individuals and the Silver Buckle Drill Team, who came to Manhattan early just to help us out. Our thanks also go to all the supporters of the Spaghetti Dinner and to all the sponsors (listed on our website), including our premier sponsors Women’s Health Group, GTM, Cox Bros. BBQ and Drew Zink.